A couple of weeks ago, Don Leiser (the web manager from COBRABRAID) contacted me and told me that their new Zipbraid Paracord Bracelets were now available and asked me if I would like him to ship me 2 out for a review. What makes these bracelets so cool when compared to other paracord bracelets is that these Zipbraid bracelets are advertised to unwind in a mere 5 seconds! And I must admit, after using one of the regular COBRABRAID Paracord Bracelets for the last few months, I have come to like the whole concept of using these “survival” bracelets. So when Don asked me if I would like for him to send me some of these Zipbraid bracelets for a review, I said sure! Don suggested that he send 2 of the bracelets, this way I could actually wear/use one bracelet and unwind the other one for demonstration purposes. (After all, the beauty of these bracelets are in how fast they will unwind, and lets face it, this is what we all want to see…not just me wearing it.) So this time when requesting the bracelets, I asked Don to send two different sizes, one that was 8 inches and one that was 7.5 inches, this way I could keep the one that was a little better fit. Also, I decided to go with a more earth-tone color with this bracelet, so I requested them both in the “Desert Camo” colored paracord. These bracelets are made using the same, real-deal, 550 paracord (featuring 7 inner woven strands surrounded by a tightly woven sheath) that is made in the USA by a military contractor and is used in the other COBRABRAID Paracord products. The only difference (as far as I can tell) is in the actual braid that is used to weave these bracelets (Cobrabraid vs Zipbraid). As well, all of the Zipbraid Paracord Bracelets come with a stainless steel shackle as the closure device (the other closure devices on the site are not an option for this particular bracelet due to the design). I have come to enjoy using these “survival” bracelets while on a hike for the simple fact that I was able to take the weight of extra cord out of my “pack” weight since I can now wear the cord on my wrist as a bracelet and call it worn weight (for those gram counters, that technically means a lighter “Base Pack Weight”). However, I will also admit, that the fit of the original COBRABRAID bracelet was a bit annoying being that it is so stiff. It is stiff enough to feel more like a hard plastic band around my wrist that will not conform to anything. This is really only a nuisance when sitting around, but when I am up and hiking, it has not been a problem. Saying that, initially, the Zipbraid bracelet felt quite a bit less rigid and more flexible than the Cobrabraid bracelets. So, despite the larger bulk of the Zipbraid bracelet as opposed to the Cobrabraid bracelets, this one seemed like it would be a more comfortable fit. So, I tried it on…and I found my speculations to be accurate, at least initially! So, I know that I have not used this product yet in the field, but initially, I am happy with it. The cord is the real-deal 550 Paracord, and the buckle seems to be strong and of good quality. I feel that both of these items could be of some use when in the field if needed. As well, the bracelet is more comfortable for me to wear than the previous bracelet. So, I would like to say thanks to Don Leiser and the rest of the guys & gals down at COBRABRAID for giving me the opportunity to check out these Zipbraid bracelets. I look forward to using it…one way or another. Disclaimer: These bracelets were provided to me free of charge from COBRABRAID for reviewing purposes. However, the above post represents my personal opinion after handling these bracelets on my own. 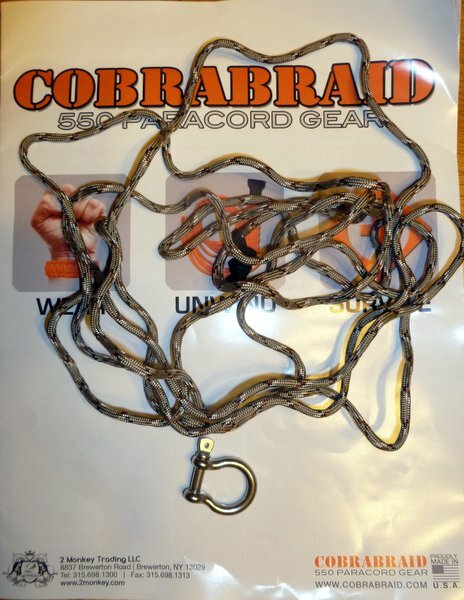 This entry was posted in Cord/Rope, Gear Reviews, Gear Stores and tagged 550 Paracord, Backpacking, COBRABRAID, Hiking, Paracord Bracelets, Survival Bracelets, Zipbraid Bracelets. Bookmark the permalink. How do I get those bracelet in order ? 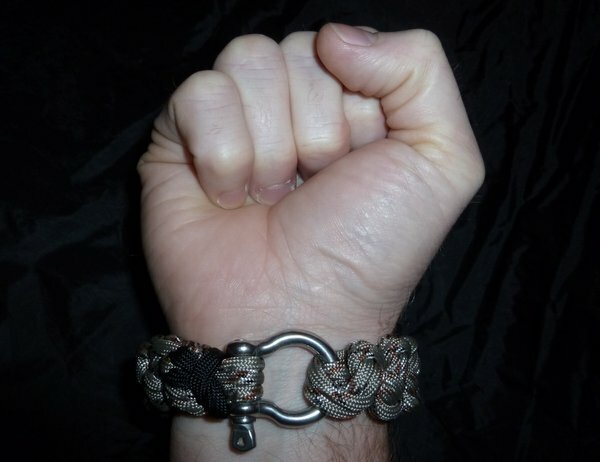 I love metal shackles in my paracord bracelets (you can see a few of my bracelets at http://paracordcentral.org/). I like to use the ones with adjustable length though! Enjoyed your review so much ordered one of thses for my use. Thanks for all your great info.